What are the morphic likenesses of the Angelic Powers? what the fiery? what the anthromorphic? what are the eyes? what the nostrils? what the ears? what the mouths? what the touch? what the eyelids? what the eyebrows? what the prime? what the teeth? what the shoulders? what the elbows and the hands? what the heart? what the breasts? what the back? what the feet? what the wings? what the nakedness? what the robe? what the shining raiment? what the sacerdotal? what the girdles? what the rods? what the spears? what the battle-axes? what the measuring lines? what the winds? what the clouds? what the brass? what the electron? what the choirs? what the clapping of hands? what the colours of different stones? what the appearance of the lion? what the appearance of the ox? what the appearance of the eagle? what the horses? what the varieties of coloured horses? what the rivers? what the chariots? what the wheels? what the so-called joy of the Angels? The Angelic Hierarchy, Pseudo-Dionysus the Areopagite. If you enter the National gallery in London through the doors to the Sainsbury wing and look up the stairs, you will see one of the gallery's most breath-taking paintings – The Assumption of the Virgin by Francesco Botticini. 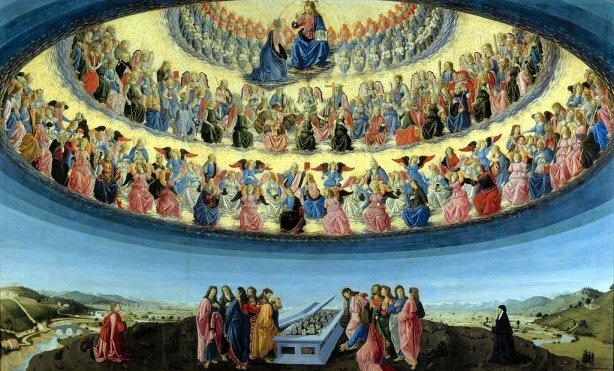 I’ve discussed elsewhere the Earthly scene in the lower half of the painting when considering images of the Assumption; now let’s look up to heaven and study those angels. As I am going to discuss below, the hierarchy of angels consisted of nine distinct orders, with the most senior at the top. Botticini interpolates saints among the angels. Most theologians went along with this hierarchy, though predictably there was much else that they disagreed on. The structure was codified by the splendidly named Pseudo-Dionysus the Areopagite, and debated by such luminaries as St Gregory, Peter Abelard and St Anselm of Canterbury. This has continued up to the present day; The extraordinary book The Physics of Angels by Rupert Sheldrake and Matthew Fox relates the theology of angels to contemporary discoveries in quantum mechanics and theories of the conscious universe. They suggest that the great medieval thinkers such as Anselm and Hildegard of Bingen had an innate understanding of quantum theory, and the hierarchy of angels can be related to the various properties of the electromagnetic spectrum. Phew! Dionysus the Areopagite was a convert to Christianity by St Paul, and is mentioned in the Acts of the Apostles. Pseudo-Dionysus was a sixth century theologian who took on the mantle of the earlier figure, possibly because of the link with St Paul who named a number of the angelic ranks in his letters. The text on angels, the Celestial Hierarchy, was little known until translations from the Greek appeared in the ninth century, although Gregory the Great was familiar with it. I’ll begin by exploring the earliest Christian images of angels, perhaps best described as pre-Dionysian.